Elpress Al/Cu terminals for Al-conductors are made of solid material. We produce the Elpress terminals using friction welding, which means that the aluminium is joined to the copper. This is done by rotating the aluminium while in contact with the copper under pressure, which is the method that provides the best bond between aluminium and copper. We manufacture type Elpress AKK, AKS and AKP S Al/Cu-connectors, but also many customer-adapted terminals (including some larger than 1200 mm²). * Type Elpress AKK terminals are used to terminate Al-conductors at Cu bus bars. * Elpress AKS type through connectors are used for joining Al-conductors to Cu-conductors. * Elpress AKP type pin sleeves are manufactured for connecting Al-conductors to apparatus with copper terminals. 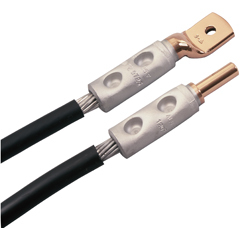 * Elpress AKS-10S type transition through connectors are used for joining stranded Al-conductors to solid 10 mm² Cu-conductors (e.g. Excel, Excelett). Elpress Al/Cu-terminals are marked with a logo, conductor cross-sectional area for stranded and solid conductors, and references to pre-forming and crimping tools within the Elpress range. The tool reference for hexagonal crimping of copper is also stated on through connectors. When crimping is completed with the correct tool, the Elpress dies and punches stamp the sleeve so that all connections can be checked afterwards. Except for the hobby tools, there is a built-in full closure system which ensures that the complete crimping procedure has been performed – a condition for ensuring a professional and high quality job. When crimping, two crimps are always performed on the Al-section and usually only one on the Cu section. Check the recommended number of crimps (see the pdf file Hydraulic crimping system, below) before crimping.